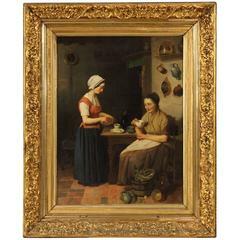 This 19th Century Oil on Canvas Flemish Interior Scene Painting, 1870 is no longer available. Antique Flemish painting from 19th century. High quality framework of pleasant decor oil on canvas depicting interior scene with card players in the tavern. 20th century wooden frame, lacquered, gilded and painted of beautiful decoration. Framework for antique dealers and collectors, of great size and impact. In good condition with some small signs of the time. Sight size: H 76 x W 100 cm.